3M 468MP 전사테이프(Transfer tape)양면테이프는 200MP 점착제를 사용하여 명판, 높은표면에너지 프라스틱에 적 합합니다. • High performance solvent-free acrylic adhesive for exceptional environmental resistance and enhanced bond strength. • Superior adhesive smoothness for improved clarity and reduced telegraphing through thin plastic facestocks. • High cohesive strength for resistance to edge lifting and slippage. • 2.0 mil 467MP is ideal for application to relatively smooth surfaces. • 5.0 mil 468MP is ideal for application to a variety of rough or textured surfaces. • Long term bonding of nameplates and decorative trim to metal and high surface energy plastics in the automotive, appliance and electronic markets. • Excellent adhesive for bonding metal and plastic nameplates in the aerospace, instrumentation and medical markets. • Used for lamination to back printed polycarbonate or polyester graphic overlay materials in the automotive, electronics and membrane switch markets. 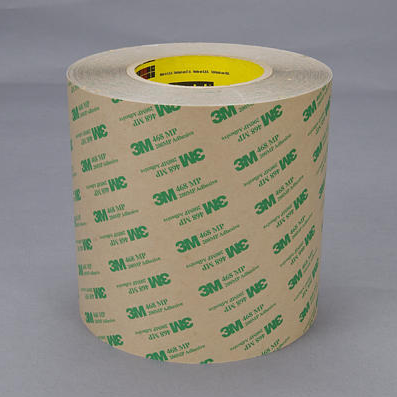 • Used for lamination of wood veneers and plastic laminates to cabinetry and furniture. • Used in the assembly of membrane switches, including spacers for circuit separation graphic overlay forswitch display and bonding the complete switch to the application surface.